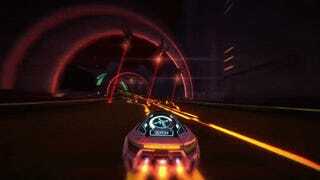 I don't like very many racing games, but Distance's high-flying antics and F-Zero-style looks have got my attention. I mean, check that out. It's all speed, air, and pulsating lights that are one-part Tron and one-part skeezy underground rave. Also, cars can get cut in half and regenerate, and—unlike a not insignificant number of cars—these ones can fly. Oh, and the hologram UI on the back of the car? Such a cool little touch. Basically, I tend to dislike racing games except when cars are doing things cars should never, ever do. This means I also adore Burnout and Mario Kart. Yes, I'm one of those people. Distance ran a successful Kickstarter a couple years ago, and now it just entered beta. Sadly, it's backer-only for now, but the plan is to let everybody in sooner or later. "We are looking into eventual distribution like a public Beta through Humble Store and Steam Early Access, but that's still a ways off," developer Refract Studios wrote in an update. For now, though, it seems to be pulling in a pretty good crowd. Beta players have already created over 60 maps and uploaded them to Steam Workshop. There's a Batman map and even a really impressive recreation of Rainbow Road from Mario Kart. So those are some things to look forward to. Here's hoping Distance isn't too far off, despite ample opportunities a long wait would provide for just, like, the worst puns.